After a successful career in the restaurant business in Melbourne and cattle farming in Victoria's high country, I decided it was time for a radical change. I wanted to embark on a new chapter that would combine my life-long passion for horses and riding with a new understanding of the horse/human dynamic, all to evolve in a natural setting that would showcase everything I cherish. It's not so much that I found Banyandah (meaning 'home on the water'), it's that Banyandah found me. 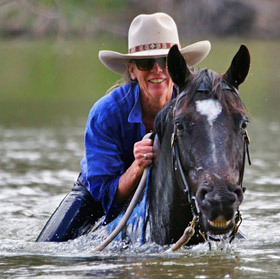 Against the backdrop of the Murray River and the majesty of the gums that line its banks, I made a home that is a magnet for anyone interested in the pursuit of natural horsemanship skills and personal transformation.